An innovative, reliable and consistent tool to measure sepsis, created through a powerful partnership driven by the Academic Health Science Networks (AHSNs), was shortlisted for a HSJ award 2018 in ‘Enhancing Care by Sharing Data and Information’. We did not win the category, but it was still an amazing opportunity to be shortlisted. The ‘Suspicion of Sepsis (SOS) Dashboard’ tool has been created by Imperial College Health Partners (ICHP) through the Patient Safety Collaborative (PSC), in collaboration with NHS Improvement and NHS England, and building on the methodology for measuring sepsis previously published by Oxford AHSN. Sepsis is a common and potentially life-threatening condition. Without early identification and treatment there is a significant risk of long term disability or death, but sepsis currently doesn’t have a gold standard diagnostic test or stable clinical definition. The new dashboard tool enables NHS staff – for the first time ever – to use reliable data to monitor and assess the impact of interventions on deteriorating patients with SOS. It focuses on measurement of interventions, which helps local teams determine which methods work best, and which may need to be spread more widely across their organisation. 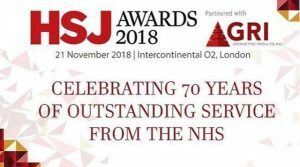 The HSJ awards are one of the largest celebrations of healthcare excellence in the world, recognising and promoting the finest achievements in the NHS, and showcasing them to the service’s most influential leaders. Winners of the HSJ Awards 2018 were revealed at a ceremony at the Intercontinental London hotel on 21 November. Imperial College Health Partners (ICHP) innovates and collaborates for a healthier population. We turn the potential of innovation into reality to help solve pressing challenges by collaborating across the health sector. By connecting a unique network of health experts we can accelerate the adoption and spread of innovation amongst our member organisations. Imperial College Health Partners is a partnership organisation bringing together NHS providers of healthcare services, clinical commissioning groups and leading universities across North West London. We are also the designated Academic Health Science Network (AHSN) for North West London and a member of The AHSN Network. How are we tackling sepsis?